A week ago, Wang called it "surviving." Over the past six weeks, that's exactly what's happened. The Saints haven't dominated, or even reassured. They've lost as many games as they've won. They've dicked around and looked completely lost at times. Yet with some seemingly reptilian blood, their heart beats on this season. And now, in the most unwelcome of environments, the Saints are lurking on the outskirts, angling for one more skirmish. In Seattle, they've certainly found the trouble they're looking for. "We got our wish" said Marques Colston about the rematch with the Seahawks. Careful what you wish for and all that, but nah. This season just wouldn't be complete without another game versus Seattle. For a significant portion of the regular season, the Saints and Seahawks were on a crash course for a huge postseason clash. For better or for worse, this game will define the Saints' 2013 campaign. Will the Saints shock the world? Will they live on to see another fight after this weekend? If the past two years have revealed anything, it's (ahem) the abundant evidence of the Saints' strong survival instinct. The NFL wanted to make an example out of the Saints. The Saints have instead become an example for how an organization can overcome adversity, regardless of its source or legitimacy. The first road playoff win in Saints franchise history would have been significant regardless of when it happened. That it happened one year after the league office delivered a potentially crippling blow to the team makes it even more impressive. 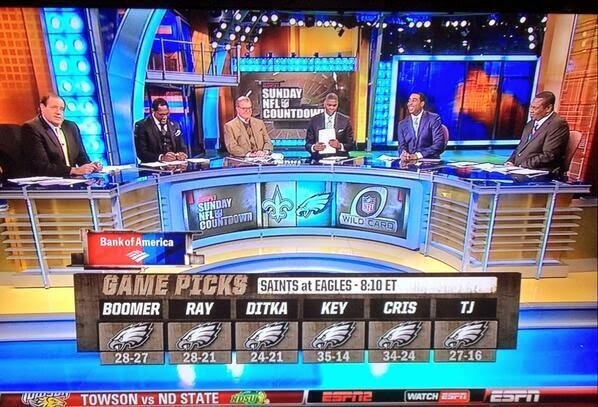 Of course, all signs now point towards the Seahawks walking over the Saints on Saturday. But remember: Pete Carroll winning three straight games against Sean Payton isn't some inescapable certainty, especially not against a Saints' team that's proved deft at upending convention. The Saints might be left for dead at the moment, but they haven't been killed off completely. And for that, there is always hope. "hanging around, hanging around ... kid's got ... alligator blood ... can't get rid of him"
During the 2011 season the Saints played a monumental divisional playoff game against an NFC West opponent, one which surely altered the course of the Saints' franchise history. At that time the Saints were the NFL's hottest team, doing much more than just surviving, having won nine straight games by an average margin of 17 points. They had accomplished that on the strength of a devastating offense, and heading into that playoff game against the 49ers, the Saints' (and their fans') confidence was at a stratospheric level. The idea that the Saints might lose that game, even to a 13-3 Niners' team with the league's best defense, seemed remote. To many of us at that time, the Saints' second Super Bowl win was nearing formality. It wasn't "if," only "how." But then Pierre Thomas got wrecked a yard from the 49ers' end zone on the game's opening drive. From that point forward, the Saints descended into a bizarre freefall that didn't reach its rock-bottom until early in the 2013 calendar year. Only when Sean Payton took the sidelines this season did that freefall ultimately end. A short eighteen weeks later and we've reached today, back in motherfucking Seattle for a second time this season, back with one more chance to fell the big, juiced Russian. What more could you ask for? Like two years ago, the Saints now face another immense divisional playoff game against an NFC West opponent. Only this time, nobody gives the Saints a shot to win -- not after "BeastQuake" and the "Monday Night Massacre" or whatever unfortunate names they're calling those games now. For the Saints, though, this game stands to be the impetus for a narrative-dismantling win and a franchise-altering year. Where the loss two years ago in San Francsico (one in which the Saints seemed destined for victory) marked the beginning of a dispiriting, scarring year, a win in Seattle on Saturday (a game nobody expects the Saints to win) might provide a diametrically-opposite, elevating effect. The game, in short, is a rare opportunity to bring it all full circle: a win that catapults, erasing the despair of a loss that buried. As the storylines and expectations are vastly different this time around, so too might the outcomes in these oddly similar circumstances. It might be a longshot, but then again that's the best part of this whole damn thing. What I'll add to that is there's a goddamn narrative at work in all of this. What the Universe is proposing to do is take this "team who can't win on the road" or in the cold and send them on a 4 week odyssey where they begin by facing [a deep freeze in Philadelphia], then back to Seattle, the scene of History's Greatest Disaster. Then, if they overcome that, they're likely off to San Francisco where there is all manner of unfinished business to deal with. Finish that up with a win in The Coldest Super Bowl Ever and there's that epic 2013 Sean Payton Revenge Tour we all bought in on at the beginning of this season. With respect to the elements, probably with the old-school sensibility of a running game and defense. Quaint, I know. Perhaps fortuitously, current circumstances are conspiring to force the Saints' hand in that direction, one which might represent their optimal victory formula anyhow. 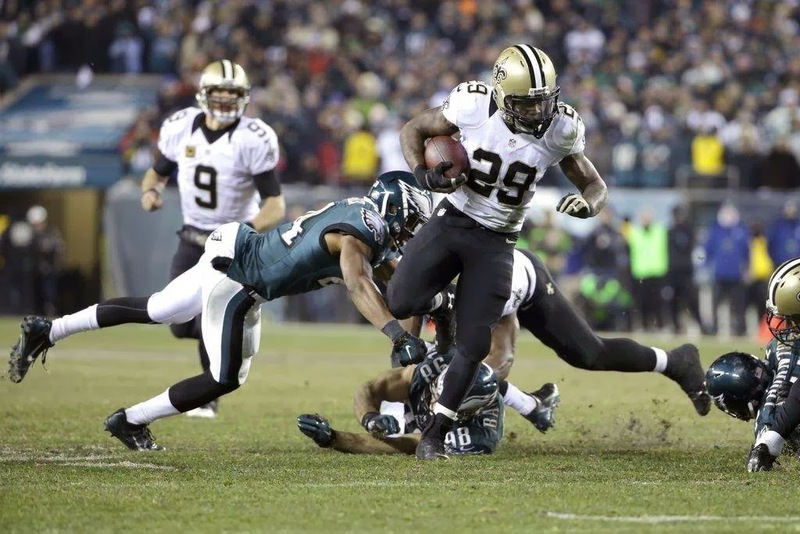 Against the Eagles last weekend, the Saints surrendered to what they've often flirted with this year: the realization that their best chance of winning, especially away from the Superdome, is a measured, run-conscious offense complementing the newfound strength of their defense. Who says the Saints can't grind out a 17-13 victory in the rain and 20 MPH winds? Anyway, how many countless times have the iterations of your life proved your preconceptions and expectations completely wrong? Certainty is the domain of fools. Lastly, make of this what you will.